A quick reminder before we get to the review: "Schrage" is pronounced like "saga" or "dodge," not like "page." Schrage is an exchange soldier from the NVA, or Nationale Volksarmee (National People's Army). He is a true infantryman that is more comfortable on the battlefield than anywhere else. He's a man of actions rather than words. His Oktober Guard teammates know him for his monosyllabic comments and protracted silences, but more so for his reliability, determinations and courage. Fancy speeches mean little when you're chin-deep in a firefight and outnumbered by the enemy three to one. That's exactly when Schrage appears at your side to fight until the very last round of ammo is gone. He's got a natural feel for battle tactics and can be relied on to figure out a fast, clean way to get the job done. All the members of the Oktober Guard (other than Stormavik, really) had some kind of distinguishing visual characteristic - Schrage's was that he wore a Schiffchen cap and had bandoliers of bullets crossed over his chest, but this figure only gets one of those right. 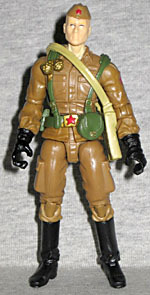 He's built mostly from Dusty's mold, with Artic Snake-Eyes' forearms and Red Star's boots. So while he looks like an infantryman, he doesn't look like Schrage; they really needed to use Rock 'n Roll's chest for the proper look. The head is the same sculpt from the 2005 Comic Pack version of Schrage, retooled to have room for a G3 balljoint - and as a side effect, to have crisper detail, since molding technology is better now than it was back then. The range of motion on the neck is still the equivalent of a swivel, which is disappointing; it's a step backwards from what we had before. 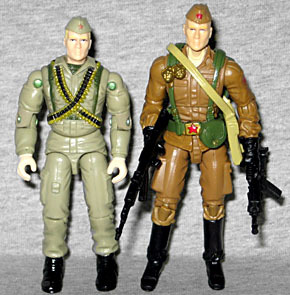 Schrage's uniform is a ruddy brown, rather than the graying beige it was on the last toy. If we were using those as a guideline, then Stormavik's uniform is closer to what this one should have been. It's a nice shade, though, and ties him in with the rest of the guard. 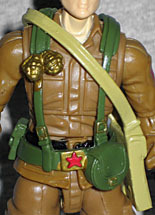 He gets the webgear and satchel that Red Star originally had, so those help break up the colors (they're molded in green and tan, respectively). The gold apps on his webgear and the red on his hat are kind of sloppy, but that varies from sample to sample, and it's not like you can pick and choose if you're getting these. In addition to those pieces, Schrage comes with an AK-47 (appropriately enough) and an M249 Paratrooper SAW, which is a NATO weapon - you'd expect a guy from East Germany to carry something from the Warsaw Pact. The SAW has a removable clip on the side, and a carry handle on the top. His green backpack has a canteen in the middle and two grenades on the right. He holds the SAW okay, but could really use a separate trigger finger if he's going to be using the AK. 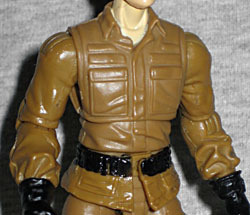 Like Stormavik, Schrage's appearance seems to be modelled on GI Joe Yearbook #2, which is why he's missing his one identifying feature, the bullet belts. He does look very much like a trooper from an Eastern power, so we guess that's what really matters.